1. Clean the seabass by gutting and scaling. 2. Cut vegetables in pieces and marinade with salted lemon in a plastic bag. 3. Heat frying pan with olive oil and garlic and take the garlic out once it is hot and grill the sea bass. 4. 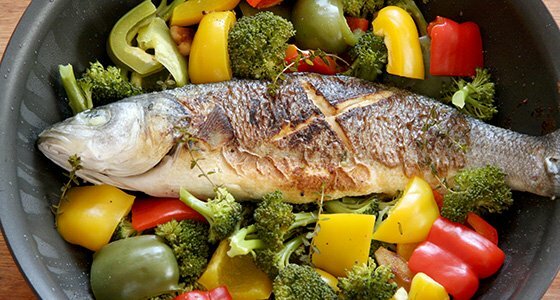 Turn the seabass over once one side is done, add all vegetables around the fish, add wine and salt and pepper, and put the lid on. 5. Cook for additional 5 to 8 min till fish is done.